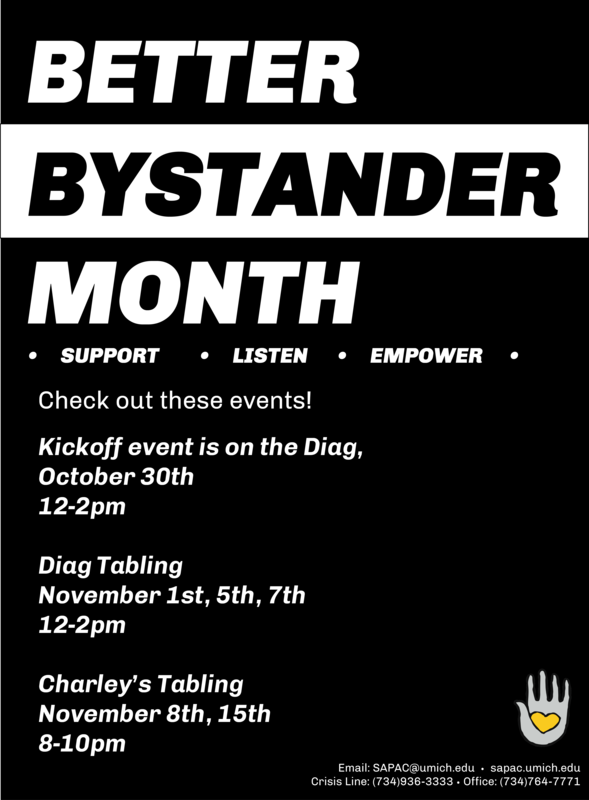 November is Better Bystander Month! 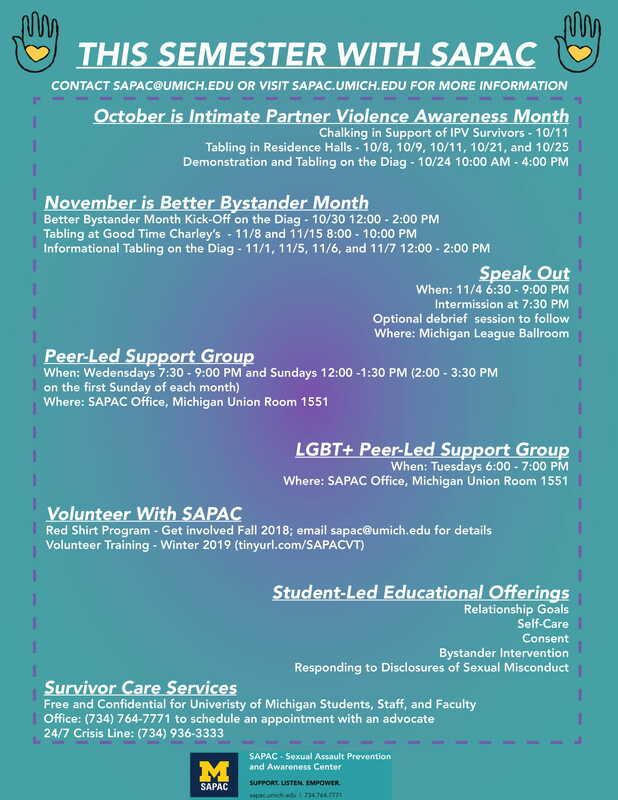 SAPAC volunteers in the Bystander Intervention and Community Engagement (BICE) program will be educating the University of Michigan community on bystander intervention at a variety of events throughout the month. 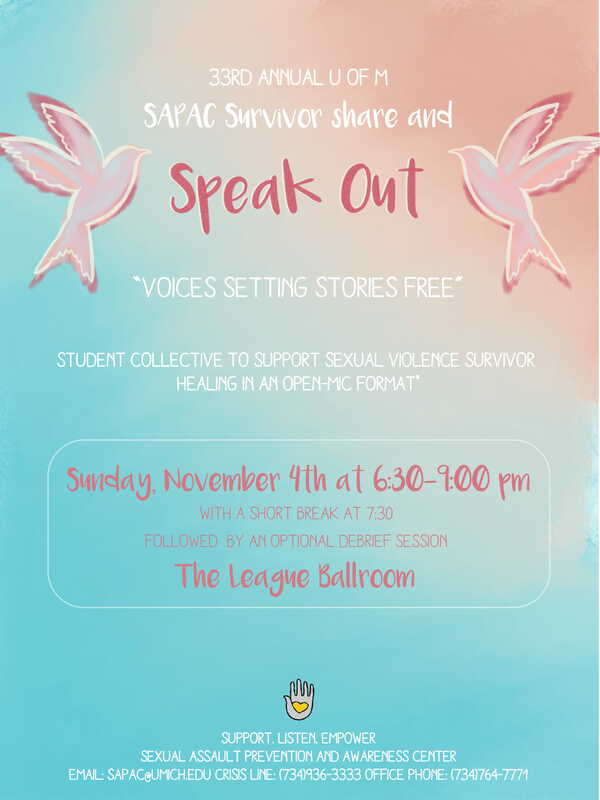 You are cordially invited to attend SAPAC's 33rd Annual Survivor Share and Speak Out hosted Sunday, November 4th from 6:30-9:00 pm in The League Ballroom. The purpose of this event is to provide a supportive space for University of Michigan student survivors of sexual assault, intimate partner violence, gender-based and sexual harassment, and stalking to share their personal story and give voice to the complexities, struggles, and triumphs of healing in the wake of sexual violence. We welcome all mediums of expression including stories, reflections, poems, songs, dances, etc. Survivors of all racial, ethnic, religious, gender and social identities are welcome. All members of the campus community are invited to come listen and offer support as survivors are provided a space to use their voice to set their story free. Want to get involved with SAPAC? Check out this handy flier to learn about many of the exciting events, opportunities, and services SAPAC is offering for Fall 2018! SAPAC's Raise the Bar program was recently recognized for its work in training Ann Arbor area bar staff in bystander intervention strategies! This article highlights that the goal of the program is to "create a safer, inclusive community," which includes the public places and services that U of M students use. Not only has Raise the Bar trained staff at many popular bars near campus, but also has trained those who interact with students through services like Lyft and Boober Tours. Channel 4 News also prepared a video that presented an overview of the program and included an interview with U of M students and staff from Good Time Charley's! Watch the Chanel 4 News clip here! Recently, Dr. Denis Mukwege, who has ties with the University of Michigan and is a Wallenberg Medal recipient, won the Nobel Peace Prize. His work focuses on sexual violence prevention in situations of armed conflict, specifically in the Democratic Republic of Congo.